In the summer of 1905 a bond issue was authorized by which means money was procured to erect a new building to house the public school for the Elm Grove area. The old site and building were sold at auction, and a new site on the right bank of Big Wheeling Creek was purchased. This site was originally part of the Moses Shepherd estate. This ground was once an Indian burial ground, and that diagonally across from the southeast corner once stood an old Indian mound. In the spring of 1906 work was begun on the new building and on March 4, 1907, the teachers and pupils said goodbye to the old school house and took up their work in the new. The Board of Education at the time consisted of U.M.Hervey (President), W.L.Duncan (Secretary), G.W.Guy, and J.F.Shirk. The architect for the structure was Charles D. McCarty of Wheeling. The contractors were Elliot & Winchell of Clarksburg, West Virginia. The cornerstone was laid on June 30, 1906 by the Knights of the Pythias, Mystic Lodge No. 24. The cornerstone can be found on the right corner of the building as viewed from Kruger Street. This building was an up-to-date structure for its time, a two-story brick, with improved basement, one of the finest in the state. It contained twelve recitation rooms, a room for the Board of Education, a principal’s office and library, and two manual training rooms. It originally housed not only grades one through eight, but also a two-year high school program. 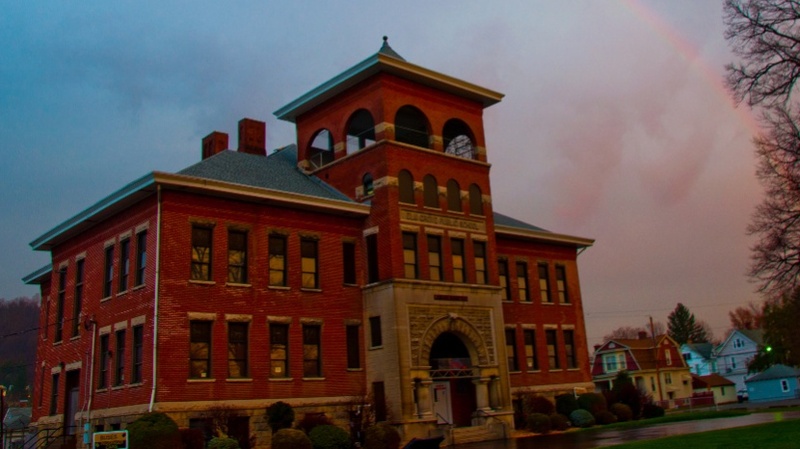 The building remained a public school until 1991, when the last classes of Ohio County Schools were held there. The building was then used by West Liberty State College for the 1994-95 school year, before being closed in the mid nineties. On March 18,1997 the building was sold at auction to the Eibel Corporation, which developed the building into the current home of the Kruger Street Toy & Train Museum. The Museum opened on September 1, 1998. The floors in the classrooms are made of Georgia yellow pine, and the woodwork throughout the building are red pine. The “tin ceilings” are believed to have been made by Wheeling-Pittsburgh Steel, and are original; they are actually pressed steel and not tin! In the belfry of the school is still found the original school bell, weighing nearly 1 ton and still operational. A few interesting side notes about the property are that the Linden tree in the front of the building is the oldest of its type in the state of West Virginia, and that the building contains embedded in its lower left corner a medallion indicating that it was the benchmark for the U.S. Coast & Geodetic Survey in 1957.